How to contact family and friends in Vieques after Hurricane Maria? Five days ago, we created this post about the damage done in Vieques after Hurricane Maria. Little did we know that it would be relied on as one of the few ways to get into touch with the island community of approximately 9,000 people. Shared over 2,000 times, we didn’t realized this small blog post would get so many visitors inquiring and pleading for more information about their loved ones. How to Contact Loved Ones in Vieques After Hurricane Maria? 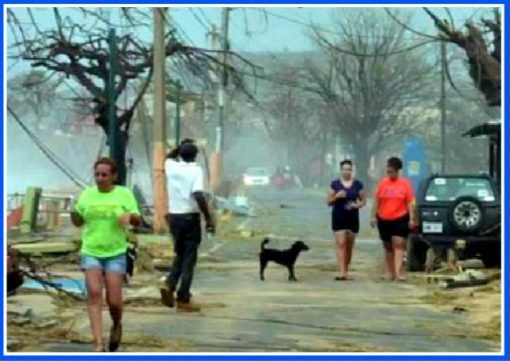 The fact that our post went viral highlights the extreme lack of media coverage about the damage done to Vieques (and Puerto Rico) after Hurricane Maria. That coupled with the island’s inability to communicate with the mainland only served to compound the issues. With all that going on, we wanted to create a separate resource as another way for family and friends to connect with their loved ones on Vieques, or to communicate with friends and neighbors that are safe in Vieques whom might be able to connect with or look for them. Here’s a handful of different resources, forums, and contact information that we’ve been made aware of in the last five days. We organized the options in order of how you check them. This publicly-shared Google Sheet is the first resource you should click on. Called the “Vieques Safe List”, it’s a basic spreadsheet that lists the first and last names of those that have been supposedly been confirmed safe. Sorted by FIRST NAME, the title of the spreadsheet displays the day (not exact time) it was last updated. We’re not sure whom created it, but it feels like a grassroots effort with those on the ground updating it. As mentioned by the Miami Herald, if you haven’t made contact with your loved one(s) in Puerto Rico after Hurricane Maria, the territory’s Federal Affairs Administration is asking people to email the island’s disaster relief team at maria1@prfaa.pr.gov. Due to the high volume of requests, the officials are asking to only send ONE email. Sending another email only serves to slow the process down for everyone. You may send a follow-up email only if the status of your loved one(s) has changed. You can also try to connect with those on the island via the Facebook page called Vieques Peeps. It’s a private group that you can request to join as long as you have a Facebook profile. Once you’re accepted, you can post your questions on the group’s page and hopefully connect with someone that might have news on your loved one. You may be able to find some information on loved ones at the Carribbean Hurricane Network forum for Vieques here: https://help.stormcarib.com/index.php?89. There is one forum completely dedicated to the information on people, properties and other questions regarding Vieques. As many family and friends have already done, if you’re searching still, feel free to post a comment at the bottom of this post and we’ll add their names. The following is a list of names that loved ones are looking for and have commented on our post(s). We’ll further organize this list as the day goes on but wanted to get the names up as soon as possible. Hatcher Brian also known as the "Tile Guy" or "Tile Brian"
Martinez Genovea lives next to Taverna Rst. You can also try to find family and friends via the American Red Cross. Listening to WKAQ radio station, which lost it’s roof during the storm, continues to broadcast news and can be listened to online. We can’t confirm the authenticity of any of the above resources, but want to publish out as many different ways for those looking to contact their loved ones. We’ll continue to update this post as we become aware of any more ways to contact Vieques. Looking for Tasia Ponce daughter of Angel David Morales and her baby Angel. Need to know if they are okay. We are looking for my brother Brian Hatcher also known as the Tile Guy….please let us know if you have seen or heard from him. I was also looking for Joaquin Ayala… My grandfather… Thank you so much for putting his name on here. I’m looking for my father James Ross he is black from Longview Texas..he moved to vieques 3 months ago …. Searching for Deneen Hernandez and family in Vieques. We are looking for family in Vieques. I see that Shirley Jackson is marked safe on list. However we have yet to hear if Lowell Jackson is safe as well? My 2nd mom wilda nieves from jardines de vieques te querio! My sister alba lydia fernandez. My fanily is big and cannot locate anyof then. Im crying and my heart also in million pieces for all of you. Estoy buscando información sobre mi mamá Ana Luz Encarnación mis tías Joaquina y Marciana Encarnación primos Felicito Felix Encarnación e Israel Arbelo todos de Barrio Monte Santo sector Pozo prieto por favor!!! Gracias y que Dios y la Virgen los bendiga….. Jenny de Santa Cruz 340-690-8085. I have added Bill to the list. No update yet concerning his safety. looking for my parents Eddie Rivera, Cruz M Garcia, Nauri Rivera from Monte Carmelo. Necesito saber si se encuentran bien. Looking for my sister Norma Hendricks lives in villa borinquen in Viequez. She’s diabetic and healwise not doing good. Her husband is Alex Hendricks. Norma has a daughter named Sandra Felix and a son named Luis Felix. We implored someone to let me know if they have seen her and if she is ok. PLEASE PLEASE I beg you for help anyone out there. We are looking for news about Phillip Kandel and Dr. Donna Moyers, who live in Vieques. Anyone here know of them and/or have information? Thank you. Just heard from Bill Meacham. He is safe. I have been writing letters which have returned and calls not answered. Concerned about family named Amelia, Maria Veronica, Enrique. The family name is Marin. We have always contacted them by writing to a p.o. Box 1578 , Vieques Puerto Rico 00765. This box has been used since 1940s. Please if you can help us find out if they are ok.